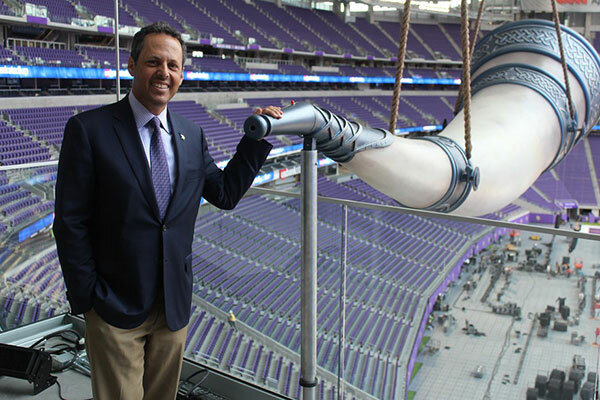 MINNEAPOLIS (JTA) – Minnesota Vikings head coach Mike Zimmer stepped up to an 800-pound gjallarhorn and exhaled with all he had to launch the festivities that officially inaugurated the team’s $1.1 billion stadium. 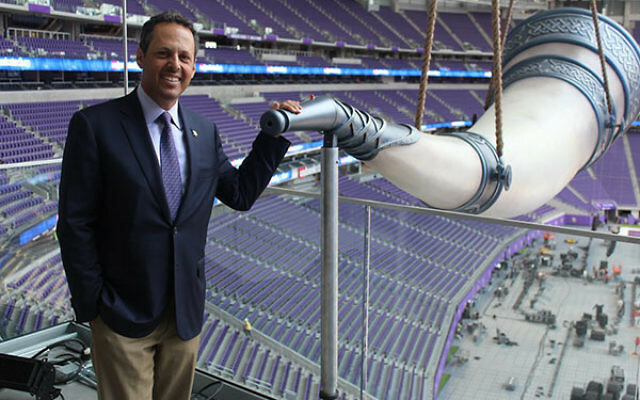 “When we first bought the team, a rabbi in St. Paul said, ‘You realize that the horns on the helmet are shofars.’ I kind of chuckle about that sometimes,” Wilf, sitting 50 feet from the newly installed horn, said in an interview with JTA 24 hours before the stadium’s dedication recently. The opening of U.S. Bank Stadium on the site of the Vikings’ former home, the Metrodome, heralds a new era that Wilf hopes will include an NFL championship — a title that has eluded the organization since its founding in 1961. Led by running back Adrian Peterson and quarterback Teddy Bridgewater, Minnesota won the NFC North division last season and reached the playoffs. The Vikings open the 2016 campaign with a road game before making their regular season debut in the new digs on Sept. 18 against the Green Bay Packers, a division foe. The ribbon-cutting ceremony in July capped the owners’ prolonged effort to build a new stadium, a process that included contentious negotiations with the state’s governors and legislature. The owners eventually agreed to pay approximately half the construction costs. William Daroff, director of the Jewish Federations of North America’s Washington office, credited Wilf with helping to raise $30 million since early 2015 to benefit the organization’s National Holocaust Survivors Initiative, which assists some of the approximately 25 percent of the 120,000 survivors in the United States who live in poverty.